It was so great to read Bonnie Hunter's instructions for Part 4 and finding that part of this step was done back in Part 1. Bonnie is really good about looking ahead at the calendar and planning the work so that the week of the major holidays there is less sewing time needed to complete that week's step. Thanks Bonnie! Above are 2 more sets of Broken Dishes blocks. It was snowing when I took the blocks outdoors to photograph them. Can you spot the 2 snowflakes on the grey patch of the left hand block? It's such a swirly fabric that the snowflakes look like they are part of the design! To see how other quilters are progressing, click here to view the Part 4 Linky for Grand Illusion on Bonnie Hunter's Blog. I've tried out some titanium coated sewing machine needles this past week. I have always used Schmetz needles and have been very happy with them. But I had heard good things about titanium coated sewing machine needles so I purchased some Superior Titanium Coated Needles to give them a try. I used a Topstitch 90/14 needle to do some quilting and really didn't see any difference. But I was amazed at how beautifully the Topstich 80/12 worked for piecing. The needle moved so easily and smoothly through the fabrics. The eye of the needle is larger than most sewing machine needles so threading the needle is really easy. I'm not giving up my Schmetz needles. I still really like them a lot. But I'm happy to know about the Superior needles. With the titanium coating, they are supposed to last longer than regular needles. I haven't used them long enough to comment on that yet. 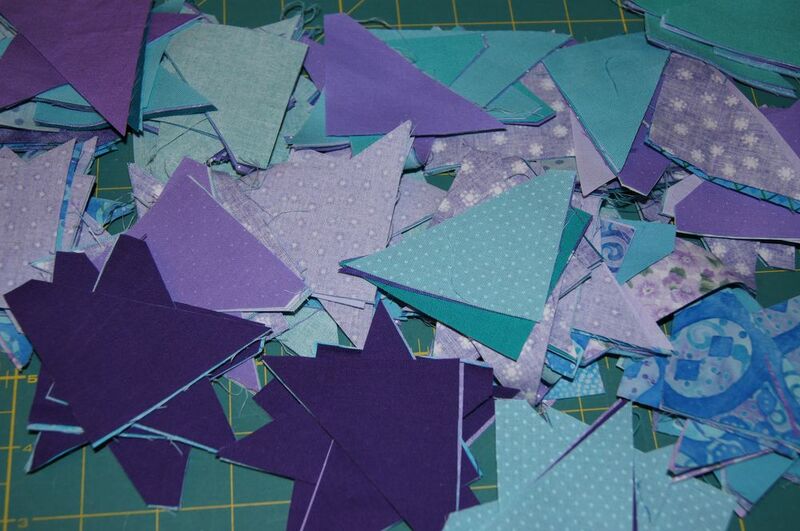 However, I think using titanium coated needles might make a lot of sense when you are doing a project with lots of piecing-- like this Bonnie Hunter Winter Mystery Quilt! For the record: I don't have any connection with the Superior needle company nor with the Schmetz needle company. Thanks to everyone who visited my blog last week based on the photo of the scissors destroyed by my dog Hazel! I enjoyed your great comments and appreciated your commiseration! Hazel is well, no harm done to her. I don't think she even swallowed any of the pieces from plastic handles she chewed up! Here are a couple of photos of Hazel with her new wide wale corduroy Pink Pig and a well loved Nylabone-- more appropriate dog toys than my sewing scissors!